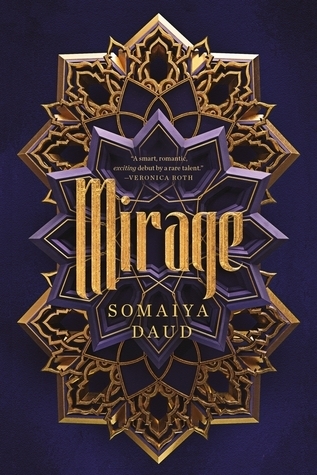 I received a review copy of Mirage by Somaiya Daud from Netgalley, and these are my personal opinions of the review copy. I was really excited going into this book! Reminded me a bit of Star Wars: Phantom Menace and I was interested to see how this version of a body double in space story would play out. Unfortunately, I did not love this book and I think it has some flaws. Character and character development are some of the most important things in a book to me. If I don’t care about the characters, then I just don’t care about the book. Initially, I was really drawn to the primary character, Amani, because she has a deep sense of respect and love for her family. So often you see YA characters who hate or fight with their parents/siblings so it was refreshing to see a character who really loved them. Amani appreciates everything her parents did to help her survive in turbulent times, and that made her really interesting to me. Her development stymies a bit though when she becomes a royal body double for Princess Maram. Since this happens only about 3 chapters in, my interest in Amani waned quickly. The body double plot isn’t something I have read a lot of, so I don’t have any major points of comparison. I find the premise interesting because you have a chance, not only for the non-royal to see how those in power live and behave but also for the royal to learn more about those she believes are beneath her. I expected Amani and Maram to learn a lot from each other and to both grown and change as a result of their close proximity and intense training. That didn’t really happen, though. In addition, the training felt far to fast and I didn’t believe that Amani was able to learn everything she needed to about portraying Maram. There is a small amount of romance, but I found it predictable and unnecessary. I could tell from the beginning it would end badly, so it was a bit painful to watch. There were a ton of other characters, but almost none of them made a major impression on me. So much of the plot felt chaotic, and some things didn’t make sense. I found it odd that Maram would be the one orchestrating her body double situation with no input from her father for instance. There was an attempt to make Maram a more sympathetic character throughout the story and it just felt forced. Overall the characters and plot felt underdeveloped. Have you read Mirage? Let me know what you thought in the comments. I was already a bit doubtfull about reading this book, now I’m definitely not sure if I will end up reading this one! Yeah, I wouldn’t recommend it sadly. I would love to find other stories that include body doubles because I think it’s a really interesting idea!